"Most mixed drink recipes are for individual drinks but this recipe is great for a small group. When I need to mix the recipe in advance, I mix everything but the sparkling water, which can be added right before serving. It's a delicious and refreshing recipe, perfect for a summer dinner party or back yard barbeque. 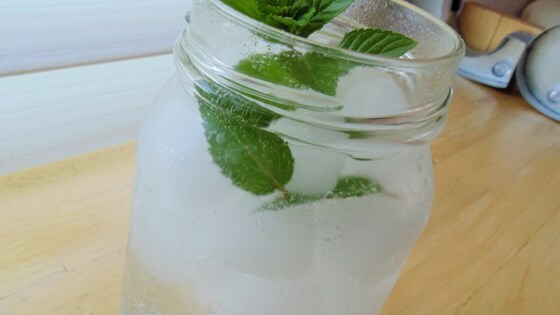 Serve over ice and garnish with a sprig of mint and/or slice of lime." Combine sugar and mint leaves in a pitcher; mash well with a cocktail muddler. Stir in lime juice and rum until sugar is dissolved. Stir in sparkling water. Fresh lime juice and mint really make this recipe but I have substituted mint oil with satisfactory results. Substitute club soda for sparkling water if desired.